Closing with the Enemy picks up where D-Day leaves off. From Normandy through the 'breakout' in France to the German army's last gasp in the Battle of the Bulge, Michael D. Doubler deals with the deadly business of war-closing with the enemy, fighting and winning battles, taking and holding territory. His study provides a provocative reassessment of how American GIs accomplished these dangerous and costly tasks. Doubler portrays a far more capable and successful American fighting force than previous historians-notably Russell Weigley, Martin Van Creveld, and S. L. A. Marshall-have depicted. True, the GIs weren't fully prepared or organized for a war in Europe and have often been viewed as inferior to their German opponent. But, Doubler argues, they more than compensated for this by their ability to learn quickly from mistakes, to adapt in the face of unforeseen obstacles, and to innovate new tactics on the battlefield. This adaptability, Doubler contends, was far more crucial to the American effort than we've been led to believe. 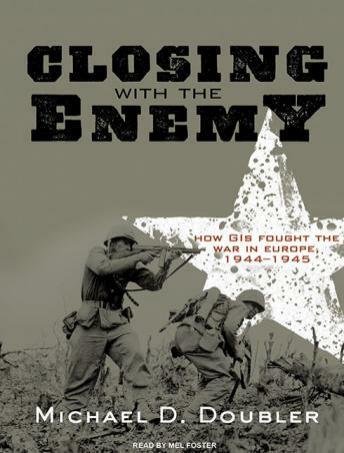 Fueled by a fiercely democratic and entrepreneurial spirit, GI innovations emerged from every level within the ranks-from the novel employment of conventional weapons and small units to the rapid retraining of troops on the battlefield. Their most dramatic success, however, was with combined arms warfare-the coordinated use of infantry, tanks, artillery, air power, and engineers-in which they perfected the use of air support for ground operations and tank-infantry teams for breaking through enemy strongholds. Doubler argues that, without such ingenuity and imaginative leadership, it would have been impossible to defeat an enemy as well-trained and heavily fortified as the German army the GIs confronted in the tortuous hedgerow country of northern France, the narrow cobblestoned streets of Aachen and Brest, the dark recesses of the Huertgen Forest, and the frigid snow-covered hills of the Ardennes. Marking the fiftieth anniversary of the American victory in the Battle of the Bulge, Doubler offers a timely reminder that 'the tremendous effects of firepower and technology will still not relieve ground troops of the burden of closing with the enemy.' As even Desert Storm suggests, that will likely prove true for future high-tech battlefields, where an army's adaptability will continue to be prized.